Blast the Rebels with Darth Vader’s TIE fighter™! Straight from the original Star Wars movie, the TIE Advanced x1 is Darth Vader’s™ personal starfighter! Even faster than a standard TIE fighter, Vader’s TIE is customized with bent wings, a deflector shield and a hyperdrive. Celebrate 10 years of LEGO Star Wars with this all-new set, featuring incredible movie-accurate details, flick-firing missiles, and the Dark Lord of the Sith himself, Darth Vader! Today Lego Star Wars Club brings you a closer look at our pick for one of the best 2009 Lego Star Wars products. This set first appeared in Toys R Us stores and other LEGO shops around the U.S. as early as late December of 2008. This simple but elegant set is priced at $29.99 and includes one of the most sought after minifigure produced by LEGO, Darth Vader himself. Tie will immediately catch the attention of kids and adults of all ages, whether collector or builder. Darth Vader and even Darth Vader's new torso makeover will also attract even more attention, nothing has been produced of its type for many years by LEGO. Another drastic change by LEGO is the abrupt change from rare chrome lightsaber hilts, to dull gray lightsaber hilts, and now in Darth Vader's Tie, the silver-gray lightsaber hilt. Everything about this new and totally redesigned set is just calling for attention. 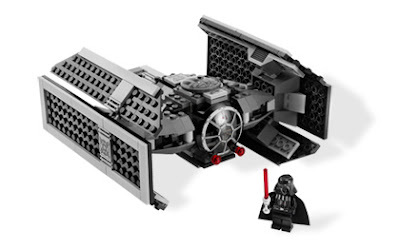 Darth Vader's tie features the old Tie fighter building techniques with joint connecter pieces for the wings and adjustable angler pieces. There is a lot of symmetry in the way that Darth Vader's Tie was designed and overall, the build is easy and straight-forward. The flick firing missiles are finally redesigned somewhat by LEGO as before they tended to either fall off completely or not fire correctly. Overall, the set is relatively easy to build for all ages from 7 up. Overall, the best play feature is Darth Vader himself, as most kids/adults don't usually pretend to fly ships around the room. The flick firing missiles are a great addition, and adds the playability of the set. If you are buying Darth Vader's Tie for parts, you should rethink even collecting LEGO. Though Darth Vader's Tie is relatively cheap and offers a high price per piece ratio, the only major parts Darth Vader's Tie are the two wings with the base plates attached to it. There are very little unique pieces besides the translucent bubble shield for the cockpit of the ship. Star Wars minifig collectors and even regular collectors will try to get this set. Everything about it says, "collect me", from the new Darth Vader and lightsaber hilt, to the new Tie Advanced. 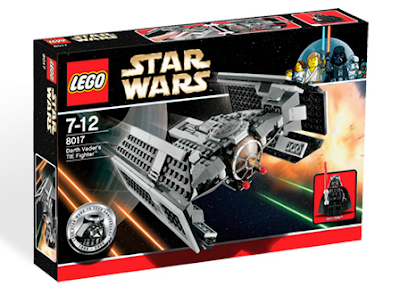 Most likely though, collector will go for Darth Vader instead of the ship, though some will see its overall value as one of LEGO Star Wars' 10th anniversary set. For collectors and other people who want to make money off of this set, I would recommend keeping at least 1 copy of this very unique set because after 2011, this set could increase by at least 200% in value if not more. My word of advice to any and every collector: this product will sell out quickly with all the high demand from even regular buyers, so buy it quickly! Darth Vader's Tie has an enormous amount of display value as having Darth Vader with his ship is very rare and is one of the most classic scenes in Star Wars. Darth Vader can also be used for other display items such as with Luke on Cloud City ("Luke I am your father") and also in a transformation scene in Episode III. With the help of a makeshift stand, this set is the ultimate LEGO Star Wars 2009 set to display on your bookshelf or on your desk! This set which includes the highly sought after Darth Vader will sell for over $20 for just Darth Vader and his lightsaber on Bricklink or Ebay. Though if you sell the set whole right now on Ebay, many people don't buy it because of the convenience of buying it cheaper at their local Toys R Us. For this set to really pay it self off, collectors (and you) just have to wait a year at the most (so that LEGO can stop producing and selling it) for it to at least double in price on Ebay and Bricklink, talk about a profit! Darth Vader's Tie is a set that can either earn you a lot of money or give you a great play experience for your kids or for yourself. It's low price tag is what really one of the greatest features of this set, and compared to Count Dooku's Solar Sailor for $60 with only 385 pieces, Darth Vader's Tie is well worth your money. The collectibility of this set makes it even more worthwhile for even a serious collector. Unless you want to miss out on LEGO's deal of a lifetime, I would seriously recommend buying this great set.